“Six Months” doesn’t seem like that long… but when you say “Half a Year” it hits you a little harder. I can’t believe that Adele has been in our lives for six months now. This weekend was her first half birthday! She’s growing leaps and bounds now. We’re starting to enter that ‘Sponge Phase’! She’s always been observant and curious, but now you can see how much she craves knowledge. When she sees something new, she HAS to touch it. And when she holds something, she HAS to taste it. It’s amazing to literally see her little brain making all kinds of new connections now. It seems like birth to five months was about attending only to her primal needs (keeping her fed, clean and rested) but now, we get to entertain her, play with her and teach her. For the first time, we notice she has a whole new range of emotions ranging from boredom and frustration to laughter, curiosity and pleasure. Our days are filled with silly sounds and antics in a never-ending effort to get Adele to laugh. Trust me, the reward is SO worth it. 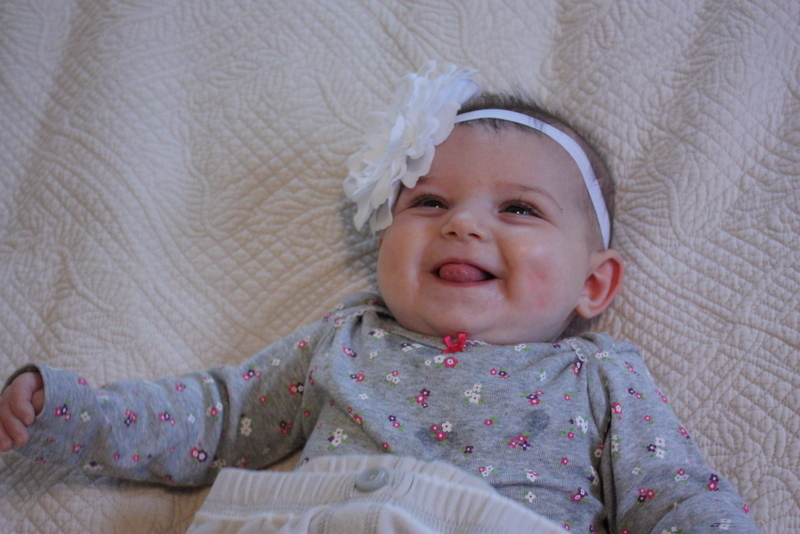 You will never know what sheer, raw joy is until you see a 6-month old laugh. Here’s the rundown of all the fun stuff that Adele brought us at the 6-month mark. Adele is still hanging out in the 25 percentile in weight and height. This week she weighed in at 14lbs and measured 25″ long. I thought babies were supposed to double their birth weight by 5 months? She was 8 pounds at birth so I guess she’s just taking her time catching up. Doctor said she’s healthy and growing fine though so we are not worried. He agreed with our theory that she’s just active and probably burning a lot of her calories. Adele can now sit by herself! I sure wouldn’t leave her unattended in that position, but she can sit for a while without assistance now! She’s always loved being upright and now that she can do it by herself is life-changing for her. haha I think it makes her feel like she’s an adult when she sits up. She likes to be included, that’s for sure. Also related, she is loving the Bumbo and her highchair now too for the same reason. We have dived into the world of Baby-Led Weaning. So far, she’s loving it. She does eat bites here and there, but for the most part, the food ends up squished in her hands and thrown on the floor. But she will sit at the table with us for an hour while she entertains herself with the food. That part is fun. I love including her! So far she’s had bites of snap peas, zucchini, sweet potato, water crackers, bread, banana, potato, avocado, tomato, lettuce, pears, cucumber and carrots! I think the sweet potato is her favorite but probably due to the texture more than anything. My favorite is when she forgets something is in her mouth and then acts confused. So cute! She’s SO close to crawling! Last week, she pushed up on all fours for the first time! She rocks back and forth all ready to go! She figured out how to crawl backwards, but not deliberately. It’s so funny when she does that because she can’t understand why she’s getting further away. My guess is she’ll be crawling by the new year! Same old, same old. She’s still going strong on her 12-hour sleeping straight through the night schedule. This continues her streak of never waking up once in the middle of the night since July! [Edited to add: The streak was broken on December 8th (her 6-month birthday) when she unexpectedly woke up at 3:30am! Guess she really wanted a snack! I think it was a fluke because the next night, she slept straight through for 12 hours again! Whew!] She still goes down around 7-7:30p and wakes up around 7:30a every morning. She gives us clear signs when she’s tired (rubbing her eyes, looking away and whining) and I try to watch closely for those cues. 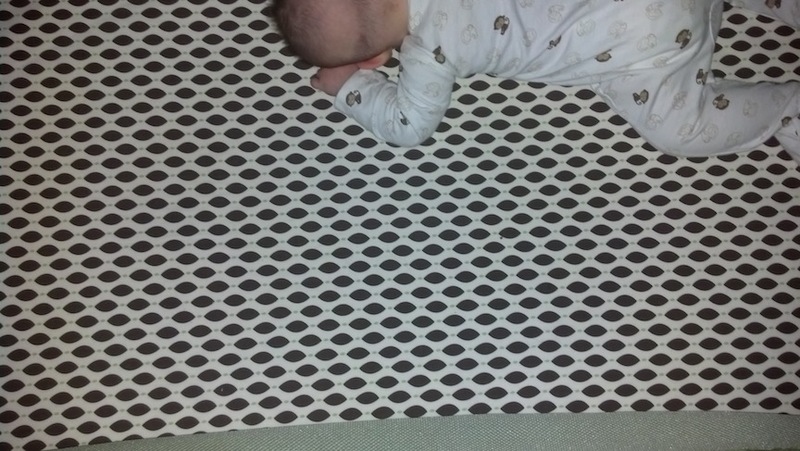 We’re two-months past sleep training and the benefits are still paying off. Most nights, I just lay her down and she goes right to sleep. I am still amazed every time it happens. Her bedtime routine is Eat Solids, Bath, Play, Storybooks, Nurse, Sleep! During the day, she’s taking three 1-hour naps a day, but I see that it’s slowly making its way to two naps a day. Her awake time is getting longer and longer now. Adele is now starting to get really interested in toys! At Daycare she plays with her Fisher-Price piano and loves it! I’m excited to get her some new fun toys for Christmas this year! It’s easy to entertain and distract her with things now. She whines when she’s bored so now we try to spend a lot of time playing with her. This month, Adele visited San Francisco, the LACMA and a couple of LA Galaxy games! -Poor Adele seems to have been fighting cold after cold (with a stomach bug thrown in there too). I’m sure she’s getting all kinds of nasty germs at Daycare. Gross. She doesn’t seem to care, but it seemed like her nose was running non-stop for about a month! Thankfully she’s completely healthy now. Knock on wood as we approach winter! -She’s still LOVING her baths. She laughs and plays in there now. It’s definitely her ‘happy place’. Girl loves the water! -I’m still nursing her morning and night and pumping during the day. Every day I seem to get less and less though. Right now, she has about 3 feedings of my milk and 3 bottles of formula. 50% is still enough motivation to keep me going though. I’m giving her every ounce of gold I can pump! I’m proud she’s still even getting some at all six months later! But oh, so stressful! -Even though she doesn’t need me to rock her to sleep anymore, I still do it once or twice a week just to watch her slip into slumber. It’s so beautiful to watch. I fall in love with her all over again every single day. You guys were all right when you told me I’d miss rocking her when it was over. I find myself grateful for the opportunities to do so now. I love her so much! Physically, I’m rocking it. I feel great. Miraculously, I’m about 10 pounds below my pre-pregnancy weight! (Thank you breastfeeding!) Though it doesn’t really matter, I did squeal when I realized my post-wedding skinny jeans were even a little too big! Whaa? Emotionally, I’m admittedly still all over the place. I have days where I am so happy and content, and other days where I feel like everything is all wrong. I’m having a tough time finding balance. When I’m at work, I wish I was with Adele. When I’m home, I feel like I should be working (or doing one of a hundred other things on my to-do list). I’m combatting this by trying to live in the moment as much as possible. I am striving to give 100% to whatever I’m doing, but the reality is that it’s about 80%. I have a hard time wearing the wife-hat, mom-hat, me-hat and work-hat all at the same time. It’s impossible. I also miss my family terribly. Wish there was a way to bring the two coasts physically closer together! 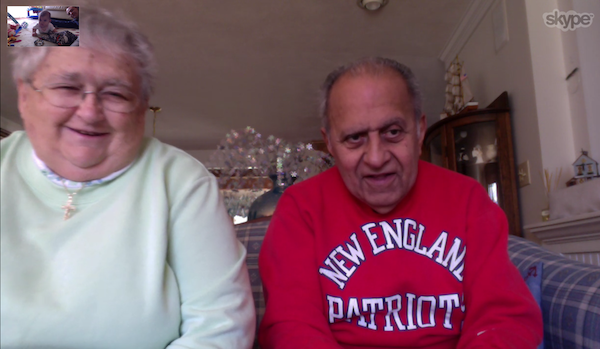 Thank god for Skype! The good news is that I’m building quite a strong circle of friends out here now. I’m SO thankful for my weekly playdates and all the new friends Adele has made. It’s made all the difference for me this year. I feel very lucky! Other than that, we’re having the time of our lives with Adele now. We’re approaching some really fun months ahead and we’re trying to slow it down and enjoy it all as much as possible! The holidays are going to be super fun with her this year I am am so So SOOO excited! It’s been an amazing month, but I have a feeling the best is yet to come! Bring it on month Seven! Ah, she is growing up so fast!!! Happy half birthday to your little girl!! Happy Half Birthday Miss A!!!! I think when they get on all fours and start rocking is absolutely hilarious and cute at the same time. Isn’t it great that they love to sit at the table for so long. L can sit and eat for 2 hours at a time, as long as he has something to shove in his mouth :).